This is the only known work of art in which the two greatest icons of Scottish history, Robert Burns, the National Poet, and William Wallace, Guardian of Scotland, are shown together. 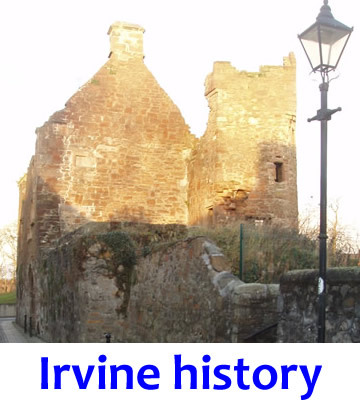 The imaginary meeting takes place on the Old Bridge of the town of Irvine, an ancient Royal Burgh historically associated with both men. Aged 27, William Wallace embarked on his campaign against the English by leading a number of skirmishes against the invader. In 1297, he routed a much superior English army at Stirling Bridge. Following this and other lesser military victories, he was proclaimed as people’s champion and, in 1298, Guardian of Scotland. His success was short lived, however. Following a heavy defeat by Edward I of England, “Hammer of the Scots”, Wallace resigned as Guardian. Failing to find support abroad, he returned to Scotland and to betrayal. Taken to London, he was tried, unjustly convicted of treason and hanged, drawn and quartered in August 1305. Despite this bloody end, his martrydom has inspired Scots throughout the ages to dream of that freedom and the equality of humankind that Robert Burns was to champion Worldwide 500 years later. 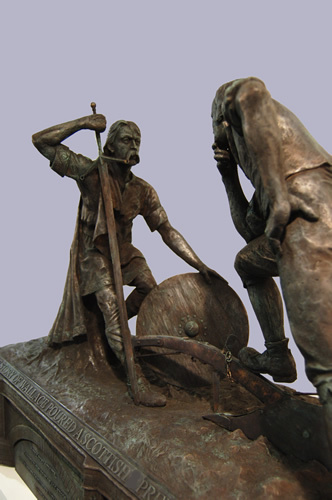 John Strawhorn ('History of Irvine', 1985) records the tradition that, sometime prior to 1297, Wallace successfully ambushed an English force seeking access to the burgh by a ford of the River Irvine known as the Puddlie-deidlie (“deadly fight”) near to where the Old Bridge depicted in the bronze was subsequently sited. This enduring tradition is commemorated by a rider costumed as Wallace in the annual Marymass Festival parade. 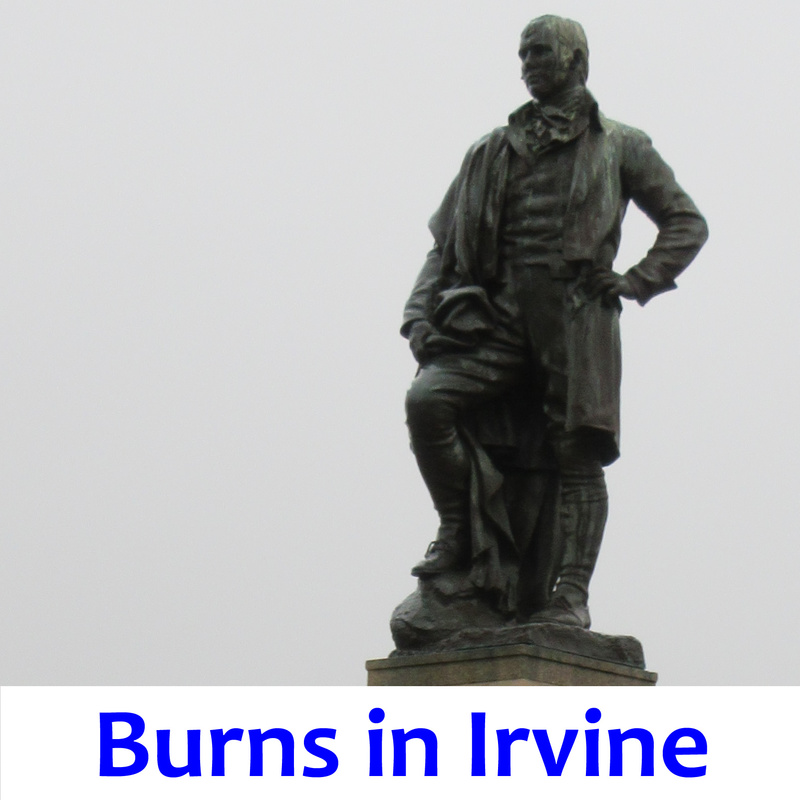 Of Robert Burns it has been said that, while the man was born in Alloway, the poet was born in Irvine. This refers to Burns’ well documented sojourn in the town over the Winter and Spring of 1781-2 to learn the trade of flax dressing. It was here that he “learned something of town life”. It may have been in Templeton’s bookshop in Irvine that Robert discovered, and became fascinated by, the work of Robert Fergusson, a brilliant young Edinburgh poet writing in Scots. It is certainly true that, while in Irvine, Burns came to realise his potential as a poet and was urged by Captain Richard Brown to publish his work. This led to his first book of poetry, “Poems, Chiefly in the Scottish Dialect” that, more than any other publication, was to save Scotland’s language, song and culture and, subsequently, was to lead to Burns becoming recognised, all over the World, as the Poet of Humanity. 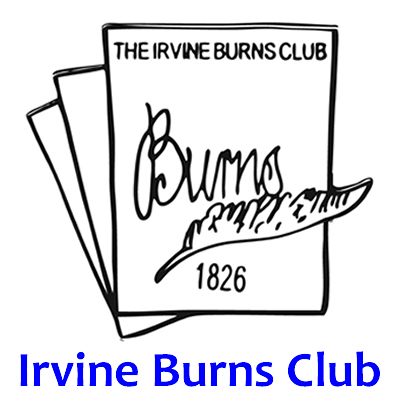 A further link between Robert Burns and Irvine was forged in 1826 when twelve men, five of whom had known him, decided to form Irvine Burns Club in his honour and memory. 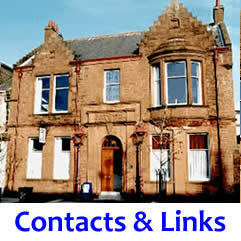 That Club has flourished and has, to this day, an unbroken record of service to the Poet and the community at large. As far back as 1985, the suggestion was first made that a piece of Scottish art, specially commissioned, would enhance the stairwell window in Wellwood and would be a significant contribution to Scottish contemporary culture. It was not until 2007, however, that a happy conjunction of events brought the idea to fruition – funding became available, a Scottish sculptor of eminence was identified and the forthcoming 250th anniversary of Burns’ birth provided the ideal raison d’etre. What was clearly required was a sculpture that was representational, original and had something to say about Robert Burns, the Ploughman Poet, his inspirational hero Wallace and the ancient town of Irvine where both had left their mark. What could be more powerful then than to depict an imaginary meeting between soldier and poet on the Old Bridge that Burns must have crossed many times in his perambulations about the town and which was close to the spot where Wallace had forded the River Irvine? Alan Beattie Herriot DA ARBS is a multi-talented Scottish sculptor, painter, book illustrator and tapestry designer who works from his Howgate studio near Edinburgh. He graduated from Duncan of Jordanstone College of Art in 1974, where he studied painting under Scottish landscape painter James Morrison and sculpture under Scott Sutherland, renowned for his Commando Monument at Spean Bridge. Alan is a versatile artist whose paintings and book illustrations are held in private collections worldwide. He was short listed for the “Not the Turner Prize” for his painting “The Fairie Queen” which was exhibited in the Mall Gallery in London and his impressive oil painting “The Battle of Killiecrankie” is exhibited in Edinburgh Castle. Regarded as one of Britain’s finest and most successful public sculptors, his monumental sculptures in bronze can be seen in towns and cities across the UK, Ireland, Europe and in Scandinavia. A list of his work would take up many pages but every piece has something of the magical about it, be it his evocative and truly beautiful depiction of “The Ancient Mariner”, or a study of Bamse, the WW II canine hero. In 2008, he was featured in a major four page article in “SCOTS”, the internationally published Journal of the Scots Heritage Society. The demanding task of casting the complicated finished maquette in bronze was undertaken by Powderhall Bronze, based in Edinburgh and one of the most highly regarded fine art founders in the UK. Run by Brian Caster and Kerry Hammond and using state of the art casting techniques and materials, Powderhall Hall is the foundry of choice of the pre-eminent sculptors in Scotland today and enjoys a reputation of being the equal of the great continental foundries in quality of workmanship. 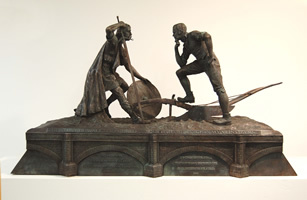 Although part of the cost of the project has been met from Irvine Burns’ Club’s special projects budget, comprising money raised by the Directors from charity dinners, the commission of this magnificent bronze would not have been possible without the outstanding generosity of the Barcapel Foundation which, over many years, has been a valued benefactor of the Club. The sincere thanks of the Club go to the Foundation and, especially, to Honorary Member, Director and Past President of the Club James Wilson OBE whose enthusiasm brought the project to fruition. The Club is also grateful to Brewin Dolphin, Complete Investment Management, for its sponsorship of promotional literature. It has been a tradition over many years that, on the Sunday nearest to Robert Burns’ birthday, flowers are laid in tribute at the statue of the Poet on Irvine Moor followed by an open reception in Wellwood. In 2009, the 250th anniversary of the Poet’s birth fell on a Sunday, making this a most appropriate day for the unveiling ceremony. This was attended by the Directors, and a large number of guests, members and friends of the Club. The bronze was unveiled by President of the Club, Iain Doole and James Wilson, representing Barcapel. 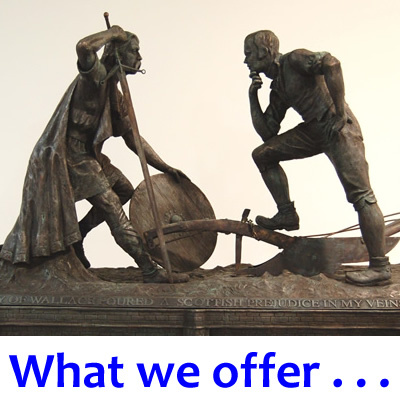 It was dedicated by Fr Willie Boyd, a toast to Burns and Wallace was proposed by Matthew Brown, appropriate readings were delivered by Raymond Fitzgerald, and an account of the making of the bronze was given by the sculptor, Alan Herriot. Creator God, we stand before this beautiful sculpture in honour of two of our greatest ancestors, William Wallace and Robert Burns, men who loved nature's freedom and beauty, who were alive with vision, dreams, poetry and song. We share their vision and their longing because their song is our song. Together with them we sing of a life that is free and simple, with time for one another, and for people's needs, based on the dignity of the human person, at one with nature's beauty, crowned with poetry! Bless this work of art, that everyone who visits this memorial of the noble humanity that these two great men shared, may be touched by their spirit, and discover within themselves something of their ancient song. May this creative work inspire those who pore over it to create a place where poetry dares to speak, where art flourishes, and where the song reigns unchallenged; where nature is welcome; where people and their needs come first; where justice speaks loudly, and where your creative voice is allowed to find expression in every human being. Amen. Robert Burns was a poet, not a warrior; a fighter for Scotland’s culture and soul with the might of his pen; a visionary with a great dream that still gives hope to humankind. But dreams can only be fulfilled when all peoples are free. Look, then, at the arches of the bridge under the figures of Wallace and Burns and read their words of liberty and peace. On the left, ascribed to Wallace: "I TELL YOU A TRUTH, LIBERTY IS THE BEST OF ALL KINGS. MY SON, NEVER LIVE UNDER ANY SLAVISH BOND." On the right, by Burns: "IT'S COMIN YET FOR A' THAT, THAT MAN TO MAN THE WORLD O'ER, SHALL BRITHERS BE FOR A' THAT." The third inscription on the bronze, "THE STORY OF WALLACE POURED A SCOTTISH PREJUDICE IN MY VEINS", running from figure to figure, and, inexorably, linking the two across the bridge of time tells, in Burns’ own words, of the effect that the story of Wallace had, not on a poet, but on a young boy who was to learn the glory and equality of all nature at the tail of a plough and was to have his devotion to his country and his people kindled by the flame of a glorious and tortured warrior. The bronze, bringing together warrior and poet, has many stories to tell, many dreams of peace to share. If, in contemplating this superb piece, your mind turns to the outstanding genius that is Robert Burns, the patriotic sacrifice that was Wallace, and the singular glory that is Scotland, then the efforts of the Directors of Irvine Burns’ Club have not been in vain. "And Burns looked back at Wallace"
To span the centuries between us. You kept your step and did not flinch. Began to struggle to her feet and find her voice.